Forty-one-year old Sam Adams makes maps for a living, but he can’t find the right route for his own life. His wife has left him, there’s a mysterious figure prowling around his backyard, and his boss is demanding he falsify maps for the benefit of real estate speculation. Even his young children abuse him, with embarrassing questions and obscene exclamations. 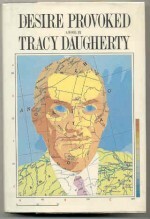 With this inventive, ingenious novel, Tracy Daugherty has carved a distinctive niche for himself in contemporary fiction. The prose style is strikingly original, an inspired blend of slapstick and metaphysics.